Jalopnik reader Kris caught up with a wind turbine blade and other parts being hauled this weekend in upstate New York. The most impressive thing about this photo he snapped? This blade is just a medium. 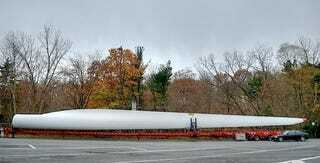 The blade was en route from a LM Glasfiber plant in Quebec, one of the largest suppliers of wind turbine parts in the world. Designed to maximize air while being as light as possible, the LM blades are built from the outside in - with paint applied to moulds first, then composites layered on top. Given the length of the M3, we can estimate the length of this blade at roughly 130 feet - one of several varieties of blades LM Glasfiber builds in that size. But it's far from their biggest. That would be the LM 61.5, a 201-foot behemoth pictured here, which currently ranks as the world's largest, installed on 5,000-kW turbines in Europe. Despite its size, the 61.5 only weighs 18 tons.